Well, the fourth and final day of the 4th ICIP Conference has officially wrapped up. Well, technically the official end was the luncheon earlier in the day, but the Post Conference session is now over as well. GU's Donna Butts did a session on "Intergenerational Programmes by Schools (Community Involvement Programmes)" with yours truly assisting and leading some of the activities. It was a great session, getting into the nitty gritty of program development with schools. A final keynote address from Professor Sarah Harper on the the future of intergenerational relations in the 21st century, the closing plenary and remarks finished off the morning. Mr. Lim Boon Heng, Minister, Prime Minister's Office spoke, which shows just how much the Singaporean government is investing in intergenerational programming, as well as Henry Quake, Dr. Leng Leng Thang and Donna Butts. Overall it's been an amazing experience here in Singapore. It will be great to see how the work here grows in the coming years. And hey, if the work here should ever bring me back to this side of the world, I don't think I would say "no." Hello from Singapore and the International Consortium of Intergenerational Programmes (ICIP) conference! All is going well here and our Singapore hosts are fabulous. We have several people here representing the U.S. including Prof. Matt Kaplan from Penn State; Prof. Shannon Jarrot from Virginia Tech; and Sister Edna Lonergan and Maggie Cary from the St. Ann Center for Intergenerational Care in Wisconsin. The conference has been full of helpful and informative sessions for and by intergenerational advocates from around the world. When Singapore's Manpower Minister, Gan Kim Yong (equivalent to the U.S. Secretary of Labor) spoke at the conference, he announced that Singapore will increase employment opportunities for older Singaporeans. His full remarks are available here. Well, day three of the conference has now wrapped up. This means the conference is almost over. :-( There have been some great plenary sessions and workshop presentations today, it's hard to know which one to highlight. There was the Multigenerational Approaches to Social Inclusion and Community Cohesion plenary this morning, and the Enhancing Community Well-being Through Intergenerational Learning that highlighted some amazing programs in Canada, Sweden, the UK, and South Korea. I ended the day with a site visit: The Peranakan Museum Experience - Keeping the Peranakan Culture Alive, which was just fascinating! Maybe it speaks to my love of all things history, but I loved learning about the Peranakans, their familial ties, traditions, culture. Many years ago traders came to this area of the world from as far as China and Saudi Arabia and married local women, these are the Peranakans, which means "child of" or "born of" in Malay. Well, this is Roxana signing off for the day. It's off to the night safari I go, if the rain will let up that is! Take care. From Roxana Martinez: Hello from Singapore! Greetings from Singapore! After a very long flight that included a stop in Tokyo, I made it. The first day of the conference has wrapped up and we're well into the second one. Day one was eventful with keynotes from members of the Singaporean government such as Minister GAN Kim Yong from the Ministry of Manpower, plenary sessions, and the Opening Dinner and the Intergenerational Bonding Awards Ceremony -- not unlike GU's Awards Banquet during our bi-ennial conference. One truly special highlight was the dinner entertainment. It was a musical group that included a young girl of about age 8 who started a lovely and modern rendition of Pachelbel's Canon in D Major on the cello and ended with an older adult saxophone player. It brought tears to my eyes, though some of those I attribute to jetlag :-) Well, I'm off to my next session. Until next time. Attention, world! 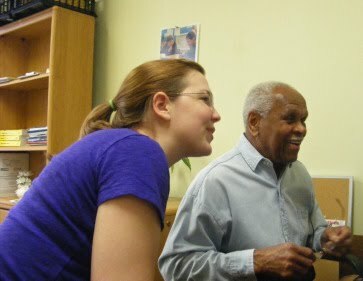 The newest member of Facebook is Thomas Taylor, 83, Generations United's own Special Advisor for Seniors4Kids. 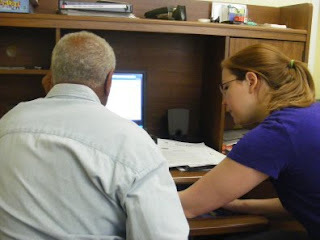 We have an intergenerational workplace here and that means Tom got some Facebook coaching today from Halina Manno, our Grants and Operations Manager. Are you on Facebook? Make sure you're connected to Generations United's Facebook page for news and resources -- and you can connect with Seniors4Kids as well! When Teddy Kennedy was a Massachusetts sixth-grader, he ate lunch every Sunday with his grandfather, John F. “Honey Fitz” Fitzgerald. A gifted communicator, former Boston mayor Honey Fitz would talk with people from all walks of life – from kitchen staffers to city politicians – asking about their children, their illnesses, their problems, their joys. Although he was born into prestige and privilege, those lunches helped shape Senator Edward M. Kennedy into a champion of the poor and the less fortunate. Where did Kennedy’s drive to help others originate? “Initially, I got a good dose of it from my grandfather,” he would tell biographer Adam Clymer, “from a person who was not preaching.” Action, not words, taught Teddy the importance of service. Senator Kennedy was not alone. Many of us learn the value of giving back to the community by observing family members or other older role models: mentors, friends or neighbors who connect across the years and share their wisdom and experience. Many in our country’s highest offices – including President Obama – were taught devotion to service at a grandparent’s knee. That commitment is growing among older adults. In 2009, 19 million Americans age 55 and older volunteered in their communities, according to the latest Bureau of Labor Statistics data. That’s more than one in four, and up from 18.2 million in 2008. Those older adults volunteered, on average, 75 hours a year. The hours add up – according to the Corporation for National and Community Service, total volunteer hours contributed in 2008 were worth an estimated $162 billion. These tangible benefits – accompanied by the intangible, long-term benefits of dedication and bonding – not only mold character, they mold a nation. A nation made of people like grandfather-and-grandson pair Ray Luyet and Quinn Hulsizer of Swiftwater, Penn., who volunteer together at their local Retired & Senior Volunteer Program in Monroe County, serving lunch and cleaning facilities for seniors and helping a physically challenged woman with errands. Or Mary Jane Stredde, 75, of Bethesda, Minn., who is known as ‘Grandma’ at the Head Start preschool where she volunteers several times a week. The benefits go both ways: The Dolby brothers – Ryan, 17, Austin, 15, and Connor, 13, are surrounded by a crowd of attentive, caring older adults on their regular visits to a Jacksonville, Fla assisted-living home. They teach Wii gaming skills – and learn patience, appreciation and respect. This week we honor Senator Kennedy and his legacy of service in marking the one-year anniversary of the Kennedy Serve America Act, a landmark law that aims to bring opportunities for service into every home, to every American. The Serve America Act boosts volunteer efforts for all ages, strengthening service learning programs across the country and highlighting the contributions of older Americans. One year ago, this legislative tribute to Senator Kennedy began to strengthen existing service programs and increase opportunities for intergenerational service in America. It expands AmeriCorps from 75,000 positions to 250,000 over five years, with ten percent of those spots saved for adults 55 and older. It creates a new Silver Scholarship Grant Program for older volunteers, rewarding them with scholarships that can be transferred to children or grandchildren. And it designates September 11 as the National Day of Service and Remembrance, calling on Americans to turn a memorial day into an opportunity for intergenerational service. Senator Edward M. Kennedy envisioned an America in which strong communities are built by the collective contributions of individuals. He also recognized the value of connections across the generations – that a grandfather’s lessons, silently delivered, could show a young boy that wealth or good fortune didn’t mean ignoring the dispossessed. Kennedy’s message continues to ring true, as new generations of youth connect across the lifespan with older adults. As we observe National Volunteer Week from April 18 – 24 and the anniversary of the Serve America Act, let us honor the contributions of grandparents and older adults everywhere – and carry on Senator Kennedy’s legacy of service. For more, visit Generations United's New Fact Sheet on the Serve America Act. We invite you to join us on April 13th from 2:00 – 3:30 pm EDT for a webinar on "Creative Ways to Generate Funds For Your Intergenerational Program." Programs from across the country have brainstormed creative ways to raise money to support their intergenerational programs. This free online training is open to anyone, but is designed for practitioners at intergenerational shared sites. Contact Roxana Martinez at rmartinez@gu.org with any additional questions. President Obama joined millions of other Americans by filling out a Census form today and indicating that he lives in a multi-generational household. The 2010 Census is expected to indicate that the White House is part a growing trend of multi-generational households. The First Family experiences a unique privilege every day by living in the White House. But one aspect of their lives that is quite common also happens to be something that often causes confusion when people fill out the census form. The First Ladys mother lives with the family in the White House. Since the census asks for a count of everyone currently living in the household - not just immediate family - the President included his mother-in-law on his census form. In 2000 over 4.2 million families reported living in a multi-generational household, an increase from 3.0 million households in 1990. The numbers are expected to continue to rise as more families come to depend on each other during difficult economic times. You can read much more about intergenrational families: their benefits and challenges, the reasons for their existence, and tips for making it work in Generations United's recent fact sheet.